OMG I love it here. Going back into lurkdom now Erin. Oh, Erin, I think you’ve outdone yourself with this one. What beautiful words. Thank you. that is a gorgeous gown, is the title reference from the Paul Simon song (Boy in the bubble) or did he get it from somewhere else? I just happened to be listening to Graceland this morning. Pure poetry, my dear! Love all your words! Oh, my!! 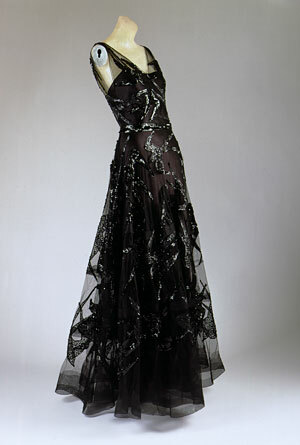 !I like this one – timeless:http://www.metmuseum.org/special/Blithe_Spirit/10.L.htmThanks for the story and the link. I want one! I saw that exhibit, and everything there was really something special. Once again, you delight and educate the fashion neophyte (which would be me!) Vionnet, Queen of the bias cut? Who knew? And this dress . . . So yummy! Oh, Erin! You are the best. As a perpetually depressed progressive, I can read DAD and find a reason to hope. There will be good things about this wretched empire collapsing. We can emerge from this mess sadder, wiser and better dressed.I’m writing you in for Chancellor of the Wardrobe. I haven’t heard a reference to Ozymandias since I left college – and in such proper context! Get your stories in print, Erin, we will need them when fashion becomes obsolete and we give in to the trekky or borg one-design-fits-all to remember when clothing helped define our individuality. Oh Rebecca, you are so right. Erin surely has the wit and poise of the Chancellor of Wardrobe, orpossibly the Secretary of Stlye/Fashion.Reading Erin’s posts is truly an education for those like myself.I hope I can understand it all before The End. If not,I will be satisfied just to dream of possessing dresses such as this.Very cool! Beautiful clothes! But the reason Wallis Windsor’s clothes were so great is that she basically didn’t do anything else with her life except focus on them (and prying jewelry out of her totally whipped husband.) She was a quite disappointing, anorexic and snobby woman who I find less and less admirable the more I read about her. But her taste…divine. Vionnet, the Duchess of Windsor, the red heifer, and Ozymandias all in one post–you have outdone yourself this time, Erin! Brava! This is the best site ever. (And thank your for the exhibition link to those amazing Vionnets, Mainbochers, and the rest. Wow. Thanks you.p.s. You’ll be available as a fashion stylist after the apocalypse, right? Awesome. What a beautiful post. And what an amazing dress! Oh Erin you are in very good voice today. Time to bust out another Secret Lives, me thinks. I love this post.. . . foxtrot . . .
Oh my! Wallis and her whipped hubby surely were dressed for the apocalypse. Somewhere I once read of the many difficulties the Duke of Windsor presented during WWII, including a story that had him wanting to turn back to reclaim fine bedding that had been left behind as he was forced out of France. The exhibition photos are wonderful, but I am a little disapointed that they don’t show the shoes or hat that are still “Wallis Blue”.The whole red cow thing makes me think of Miracle, the white buffalo that was born in Janesville. How is it that a deity should be so dependent upon earthly things? And she quotes Sting, too. Be still my beating heart…..Erin, you are a genius. But I’m neither first, nor last, to say it. ah! erin! i love this post. This is the first I’ve heard of Lott, the farmer/evangelist. sigh For the record, there ARE smart, thoughtful, tasteful people in Mississippi. And FROM Mississippi. Sometimes, you just have to laugh at (with?) the ones who……aren’t. lolYou should write a book, Erin. Marvelous post. As always. What strikes me most is the fact this thing absolutelly ISN’T out of style… Any designer nowadays could be proud to present such a dress, if it were his creation… or at least I would, if I were a designer. I’m with Cookie up there on the vapidity of the poor old Duchess. She got her prince and there wasn’t anything inside the pretty shell. Reading about her always makes me a little sad….so driven, and after she made the ultimate conquest, so quiet. The clothes, though, were gorgeous and she wore them well. In her defense, I think all the money from the sale of her jewelry after she died was donated to AIDS research. Don’t know if this was her idea, but it’s nice she finally gave something back. The thing that sounds really crabby about her is she insisted on strict punctuality and protocol at all the parties she went to (attendance of which made up the bulk of her married life), with everyone bowing and scraping to her and the duke in the Old World Manner. Jesus…GET OVER IT, LADY! Not to mention that the gorgeous park-side Paris chateau the French government lent the couple for their lifetime might have been put to better use as an orphanage, or home for unwed seamstresses or something. (But politicians tend to stick together.) I just don’t note many redeeming features about her. Oh dear, sorry…Wallis Windsor’s estate was left to the Pasteur Institute, which first isolated the Human Immunodeficiency Virus and continues to do AIDS research. I don’t know if the bequest was actually earmarked for HIV/AIDS study…but I think I read somewhere it was? I love Vionnet! I didn’t know who she was until I started FIT and haunted the Met. Should they ever do an all Vionnet show, we should all converge and toast with champagne. I was greatly amused by your first g thoughts–what to wear during the Apocalypse. Not something out of range, though.I really do like the lace dress though. Erin, I have to delurk for this post. I’ve read it every day since you posted it and every day it makes me smile and inspires me to create and dream and hope.Thank you. Vionnet convergence & champagne – I’ll drink to that!